Many of you reading this page have High Definition (HD) TVs at home and you are pretty amazed at the picture quality. Unlike when we were young watching a ‘tube TV’, you can now see crisp clean photo-quality television like we never could have imagined! Now, take that incredible 1080p HD picture with 2,073,600 pixels, and quadruple it to 4K Ultra HD with 8,294,400 pixels. The size of your TV hasn’t changed, but the pixels within that same TV have increased 4 times. 4K Ultra HD is a new class of high-definition resolution offering unprecedented picture clarity and detail. Although the technology is already in use in film production and movie theaters, it is just now coming to your home television, offering nearly 4,000 (or “4K”) pixels across the screen’s horizontal viewing area. Before 4K Ultra HD arrived, the highest-definition resolution on the TV market was Full HD 1080p, which consisted of 1920 x 1080 pixels, thus giving it its “1080p” name. 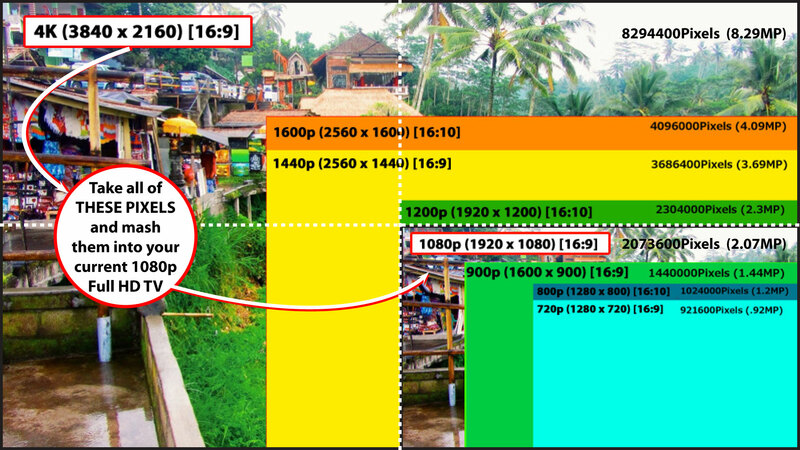 4K Ultra HD has four times the number of pixels as Full HD (3840 x 2160 pixels, or 4096 x 2160 pixels for cinema screens), resulting in its “4K Ultra HD” title. The increased resolution made possible by 4K Ultra HD’s 8.3 million pixels (vs. Full HD’s 2.2 million) enhances picture quality by reducing gaps between pixels (called the “screen door” effect) and visible pixels. This sharpens detail and shows smoother lines so that even up-close images seem clearer, more realistic, and less pixilated. Now that you know everthing that there is to know about 4K Ultra HD vs. 1080p HD, there is a lot to learn about connecting your cable TV recevier, streaming media player (Roku/Apple TV), DVD and your other devices to your TV. Standard HDMI Cable with Ethernet – This cable type offers the same baseline performance as the Standard HDMI Cable shown above, plus an additional, dedicated data channel, known as the HDMI Ethernet Channel, for device networking. High Speed HDMI Cable – The High Speed HDMI cable is designed and tested to handle video resolutions of 1080p and beyond, including advanced display technologies such as 4K, 3D, and Deep Color. If you are using any of these technologies, or if you are connecting your 1080p display to a 1080p content source, such as a Blu-ray Disc player, this is the recommended cable. High Speed HDMI Cable with Ethernet – This cable type offers the same baseline performance as the High Speed HDMI Cable shown above, plus an additional, dedicated data channel, known as the HDMI Ethernet Channel, for device networking.